According to the IUCN, several lark species are in need of special protection. Ash's lark (Mirafra ashi) is known only from six specimens collected in 1981 in a very small range in Somalia. Because its minute population seems to decline, this species is classified as Endangered. Botha's lark (Spizocorys fringittaris) is also Endangered. 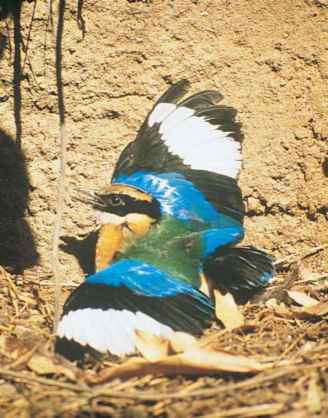 It is patchily distributed within South Africa, and its population is declining due to habitat destruction by agriculture. The situation is critical for the Raso lark (Alauda razae) and Rudd's lark. The former species is endemic to the uninhabited Islet of Raso (Cape Verde Islands), and its population is very small (92 birds counted in 1998). Accidentally introduced predators are therefore a serious threat to eggs and nestlings. A rapid population decline of Rudd's lark could be prevented by protecting its breeding range in South Africa. Four species are classified as Vulnerable because of their restricted and unprotected ranges and small populations. The ferruginous or red lark (Certhilauda burra) breeds in the Cape Province only, where habitat fragmentation continues. Archer's lark (Heteromirafra archeri) is known only from two small areas in Somalia, where it was recorded last in 1955. Only a few specimens and observations of Degodi lark (Mirafra degodiensis) and Sidamo bushlark (Heteromirafra sidamoen-sis) are known from different localities in Ethiopia. Information about breeding range and population size is even more scanty for Friedmann's lark (Mirafra pulpa) from northeastern Africa, Obbia lark (Spizocorys obbiensis) from Somalia, and Williams's lark (Mirafra williamsi) from Kenya, making it almost impossible to assess the extent of the threat to their extinction. The population of the Agulhas long-billed lark (Certhilauda brevirostris) is estimated to be around 1,000 mature individuals. Estimates for Sclater's lark (Spizocorys sclateri) are much higher, but the population is severely fragmented throughout Namibia and South Africa. Finally, the population of the Latakoo lark in southeastern Africa could decline drastically during the following decades due to habitat loss. As a result, these three species are considered to be Near Threatened. In the countries of the European Union (EU), the calandra lark, Dupont's lark, short-toed lark (Calandrella brachy-dactyla), Thekla lark (Galerida theklae), and wood lark are listed in Annex I of the EU Birds Directive as species which require special conservation efforts. All these species suffer habitat destruction related to agricultural intensification and afforestation, as well as illegal hunting and predation. The European populations of crested larks and skylarks declined during the last years, probably due to climatic change, the loss of suitable habitats, and the increasing use of pesticides. The crested lark became extinct in northern Russia, Norway, Sweden, and Switzerland in the 1990s; declined in Denmark, the Netherlands (3,000-4,000 breeding pairs in 1979 vs. 400 in 1991), France, Germany, and Poland. Skylark numbers in Great Britain declined by 51% between 1968 and 1995, a loss of approximately three million breeding birds. In 1997, only about one million pairs were breeding in Great Britain.